We have always and will continue to tow with empty. Fresh, grey and black water tanks. Extra weight will be the usual inside items, propane and maybe a few sticks of firewood. We have the same truck. Unfortunately the payload of that truck limits hitch weights! Realistically, according to the sticker, it is around #1600 lbs. I weighed it. I would recommend the Anderson hitch to save weight. Also works well. I am over sticker like #500. But, under axle/tire capacities. Tows well. Been in 40 mph winds. It was fine. Stops well. I tow a heritage glen 372 rd with my ram 2500. 43 foot ultra light. 5 slide elevated rear living 11k pounds. Weigh your truck, full fuel and passengers. Get front and rear axle weights. Determine Rear GAWR by looking at sticker on door jamb. Subtract actual Rear Axle weight from GAWR. That is the remaining axle weight capacity you have to accommodate the 5er pin weight, and hitch. Assume ~200 lbs for hitch if you are getting a conventional one. 60 or so I believe for a Andersen Ultimate. In my planning, I am assuming worse case that I will eventually load up the 5er to the GVWR. Pin Weight estimates range from 20-25%. Split the difference. 16,000 GVWR times 22.5% = 3600 lbs. This worse case scenario for pin weight should be below your RGAWR. Yes, you will clearly exceed payload, but many folks (myself included) focus on the RGAWR and to a lesser extent, the payload. If you have remaining capacity of at least 3600 lbs rear axle, after weighing truck loaded with passengers and fuel, then you should be good to go. I suspect you won't, as the RAWR is probably 6500 lbs. 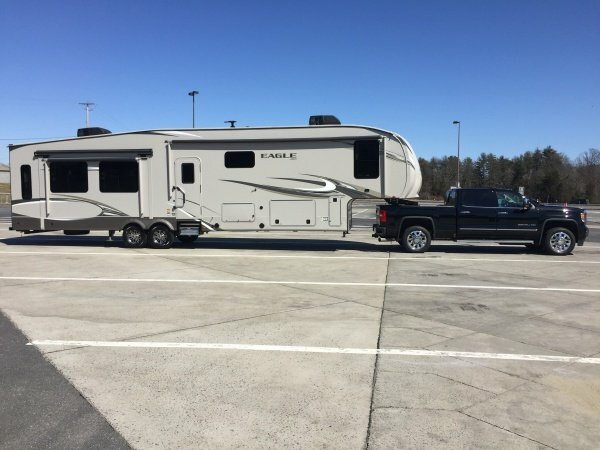 My guess is your payload is going to be under 2,000lbs with your RAM 2500 since it's diesel with the limited package with all the bells and whistles and 4x4 this is going to severely limit your choices in 5th wheels you really needed to go with a 1 ton to even consider that Grand Design. 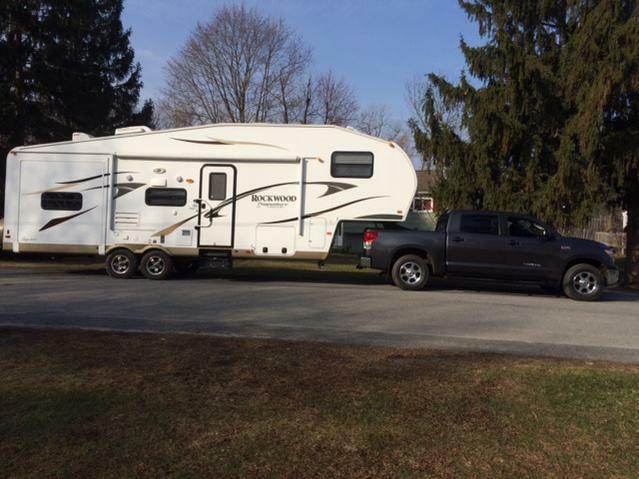 I have a 2008, 6.7L Cummins Dodge Mega Cab, 2500 pulling a 2016 34RL Cedar Creek 5th wheel trailer. The truck is not a stock model at all. I am running 60HP/120 lb.-ft. TQ over stock, TB exhaust, with gauges to monitor the EGT's, Boost and Transmission temps, with duel fuel filters, Mag-Hytec covers on the differentials and transmission for extra oil capacity and cooling. My tires are Nitto Dural Grappler LT285/70R/17 126R tires which are rated for 3750 LBS @ 80PSI. I purchased my Chevy 2500HD gasser to be overkill for my previous TT. That was to buy a 5'ver that was actually within the tow ratings of my new 3/4-ton truck with room to spare! It is 33-feet long and weighs in at 9500 pounds loaded and with 1/2 tank of fresh water and some fluids in both the black and gray tanks (maybe 1/3 full). Why didn't you get a 3500? You will be over the trucks CCC and RAWR with that Solitude. You should post your question on the GD owner forum in the Solitude section. I think you'll find out that GD's brochure weights are under the shipped weight. I tow a lot less than that with an 18 2500 6.4 4.10. My pins only 1800 lbs. the Ram 2500 coils aren't as solid as the previous model leafs. 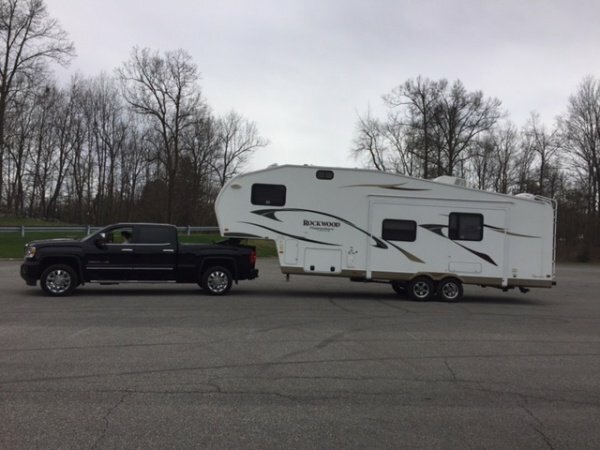 I towed the same exact 5er with a 12 CTD 2500 and it was a more solid tow. I'd seriously think about something in the 1800-2000 dry pin weight. FWIW my 1800 lb pin drops the rear 2". I can't imagine dropping another 1500-1800 lbs in the bed. You still have to add the hitch, propane, batteries and all the other stuff you carry in front of the axles.